Laboratoire Matière et Systèmes Complexes - Soutenance de thèse : Adrien HALLOU ; vendredi 8 septembre 2017 à 14h30 : "Propriétés émergentes des systèmes pluricellulaires hétérogènes"
Accueil du site > Séminaires > Archives soutenances > Soutenances 2017 > Soutenance de thèse : Adrien HALLOU ; vendredi 8 septembre 2017 à 14h30 : "Propriétés émergentes des systèmes pluricellulaires hétérogènes". PhD Defense: Adrien HALLOU ; Friday, Sept. 8th, 2017 at 2:30pm: "Emerging Properties of Heterogeneous Multicellular Systems"
PhD work of Adrien Hallou conducted under the supervision of Jean-Marc Di Meglio and Alexandre Kabla. Defense on Friday, September 8th, 2017 at 2:30pm. Location: Université Paris Diderot, Bâtiment Condorcet, Amphithéâtre Pierre-Gilles de Gennes, level -1. Prof. Jean-Marc Di Meglio, Université Paris Diderot, PhD Supervisor. Dr. Alexandre Kabla, Reader, University of Cambridge, PhD Supervisor. Prof. Jean-Paul Rieu, Université Claude Bernard Lyon I, Rapporteur. Dr. Pierre-Francois Lenne, Directeur de Recherche, Université Aix-Marseille & CNRS, Rapporteur. Prof. Sylvie Hénon, Université Paris Diderot, President. Dr. Silvia De Monte, Ecole Normale Supérieure & CNRS, Examiner. Dr. Clément Nizak, ESPCI & CNRS, Examiner. In the first part of this thesis, we study the impact of tumour heterogeneity on cancer collective invasion and metastatic dissemination. Heterogeneity within tumour cell populations is commonly observed in most solid tumours, but its impact on metastasis, one of the primary determinants of the disease prognosis, remains poorly understood. Working with a simplified numerical model of tumour spheroids, we investigate the impact of mechanical heterogeneity of tumour cells on the onset of tumour invasion into surrounding tissues, focusing more particularly on the influence of differences in cell motility. Our work establishes a positive link between tumour heterogeneity and metastatic dissemination, and recapitulates a number of invasion patterns identified in vivo, such as multicellular finger-like protrusions or tumour cell clusters. In our in silico experiments, we demonstrate that two complementary mechanisms are at play in heterogeneous tumours: a small proportion of stronger cells with a higher motile force are able to initiate and lead the escape from the tumour, while collective effects in the bulk of the tumour provide the coordination required to sustain the invasive process through multicellular streaming. This suggests that the multicellular dynamics observed during metastasis is a generic feature of mechanically heterogeneous cell populations and might rely on a limited and generic set of physical assumptions shared by most tumours in spite of the genetic and phenotypic variability amongst patients and pathologies. In the second part of our work, we continue to explore the impact of heterogeneity on population scale behaviours of multicellular systems, focusing on the development of the social amoeba Dictyostelium discoideum. 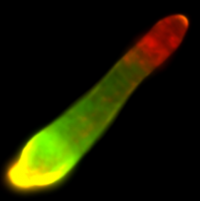 Under starvation Dictyostelium cells form multicellular aggregates named slugs where amoeba cells differentiate and segregate into two distinct spatial zones, the prespore (rear) and prestalk (front) cells regions. This developmental pattern is characterized by an homeostasis of cell-type proportions with respect to slug size and external perturbations. Different models have been proposed to explain theorigin and regulation of this pattern, but quantitative experiment were still needed to decipher between the proposed mechanisms. To quantitatively investigate cell differentiation and spatial patterning in live multicellular aggregates, we developed and characterized a new stable cell line, AX2-PYR, using genetically encoded fluorescent reporters of cell differentiation into prespore and prestalk cells. Our results demonstrate the scaling of the prespore/prestalk pattern over more than three orders of magnitude in slug size, and show the ex-istence of a proportion regulation mechanism which might rely on cell-cell communications. Eventually, using microfabricated hydrogel channels and time-lapse fluorescence microscopy, we monitor the aggregation, cell differentiation and spatial patterning dynamics of developing cells. Our results show that prespore and prestalk cells differentiate first at random into a salt and pepper pattern, once a compact multicellular aggregate has formed, prior to sort out in a two regions spatial pattern on the basis of differences in cell motility. Our results demonstrate the existence of a characteristic size for multicellular aggregates and show that confinement below this length-scale does not alter the dynamics of aggregation or cell sorting, but affects significantly the aggregate cell density and the relative proportions of prespore and prestalk cells.